Chrisopher Radcool Reynolds is co-founder of Reynolds-Sebastiani Design Services – a San Francisco-based landscape and construction company. He also has an interest in the history of San Francisco as a built environment. The project affords Reynolds the opportunity to engage in two of his favorite pursuits – collecting and research. In addition to capturing images of patent stamps and posting them online, he also investigates the companies or contractors whose stamps he finds. For his research, he reviews public utility commission reports, directory listings, and trade journals. The hard copy originals of these documents can be found in many archival repositories (such as the San Francisco History Center). Because Reynolds prefers doing his research online, he uses the digitized versions of these documents that can be found on Google Books. 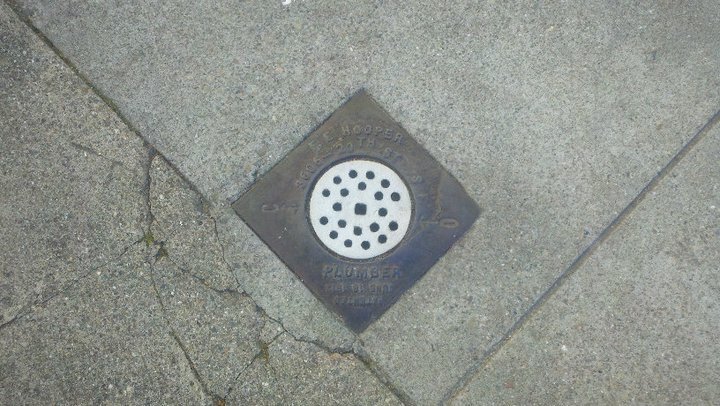 One of the discoveries that Reynolds has made is the distinction between the marks he finds on manhole covers, which relate to the history of large utility companies in San Francisco, and the marks he finds on the small sewer vents. The latter can bear the stamps of independent plumbing or concrete contractors. As a craftsperson himself, Reynolds has been thrilled to find information about specific individuals and small business owners who have also left their mark on San Francisco’s streets. Whether his research has been about big business or identifiable individuals, he has included the results of his investigations as captions to his online collection of images.